3 Pour half the olive oil into a pan and when hot add meat and fry, stirring until it’s nice and brown. Remove the meat and set aside. 8 Heat the milk and butter in a small pan, add in the potatoes. Remove pan from heat, then mash potatoes using an electric hand whisk or potato masher. 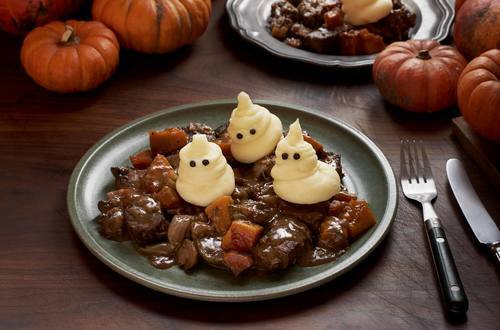 10 When the stew is ready, pipe the potato onto the dish to create the ghostly potato pals. Piping in a steady, round motion will help your pals stand up right and look fantastic. 11 Using peppercorns, carefully push into the ‘ghost’ to create their ghoulish eyes!